Garmin POI Loader is a freeware program offered to owners of Garmin navigational devices. Essentially, POI Loader allows users to customize their own navis and insert and remove custom points of interest. POI Loader allows you to add new waypoints like restaurants, work locations, buildings, officers and anything else you would like. The custom locations are added on top of existing maps and only supplement the core maps installed. Version 2.7.3 is a freeware program which does not have restrictions and it's free so it doesn't cost anything. 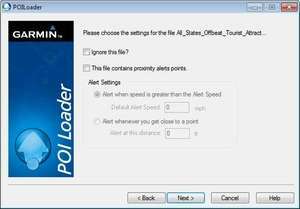 For security reasons, you should also check out the Garmin POI Loader download at LO4D.com which includes virus and malware tests. Additional screenshots of this application download may be available, too. POI Loader download been highly rated by our users.